“To begin at the beginning….”, I had hoped that by this point I would be welcoming you all to the Half Moon in Herne Hill, but while work is progressing well, we are still a month away from opening. Recent months have seen us open up the room at the back, build the hotel bedrooms – all 12 with lovely en suite bathrooms – and appoint a General Manager, Matt Dutson. That’s the good news. The bad news is that we are still completing the gas installation, which has held up the opening. The hotel rooms are looking outstanding and the Half Moon is home to the largest bedroom in any Fuller’s pub – in the old Boxing Gym. 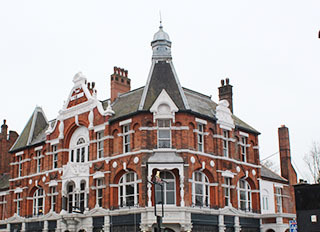 The room, at the front of the pub overlooking Herne Hill station includes a free standing bath and a luxurious super king size bed and I’m sure it will become one of South London’s favourite wedding night venues. I’m also delighted with the appointment of Matt Dutson. He’s already been meeting members of the local community and I know that he is going to be pivotal in developing the role of The Half Moon going forward. He is a very experienced General Manager and perfect for such an important pub within the Fuller’s estate. So when will we be open? Well we are pinning everything on March 20 – as long as the gas installation goes smoothly. Keep watching this space – if anything changes, we will let you know. But all things being equal, we look forward to welcoming you on Monday March 20.